"MTI was a pleasure to work with during our trial of the product. They worked closely with our company to ensure the products were installed properly. They also help to answer all questions that code officials had regarding the product. We would not hesitate to recommend MTI." 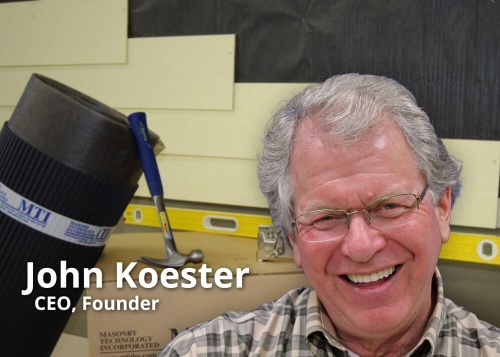 Hi, I’m John Koester-owner of MTI. I have been in the construction industry for more than 40 years. I was a card-carrying mason and cement finisher, and for many years operated my own masonry construction business in the Minneapolis-St. Paul area. I have an extensive background in waterproofing systems in the areas of forensics, design and installation oversight. I have written many articles on the topic of building moisture management at all levels of the building enclosure and have worked with architects and builders throughout North America to design the right moisture management system for their projects or to remediate problems that were the result of improper attention to moisture management when the structure was originally designed and built. Responsiveness--MTI is so nimble that it can often ship products same day, create details in a day, etc. "We have been working with Masonry Technology Inc. for years. They have outstanding customer service and are always willing to go the extra mile to help you. If you need a specification image for a builder or homeowner on the "right way" for an install they have everything you need. Their on-site training for our crew was very beneficial. Adam made everything very easy to understand. We love working with them and their products. We strongly recommend using MTI on every project we do."